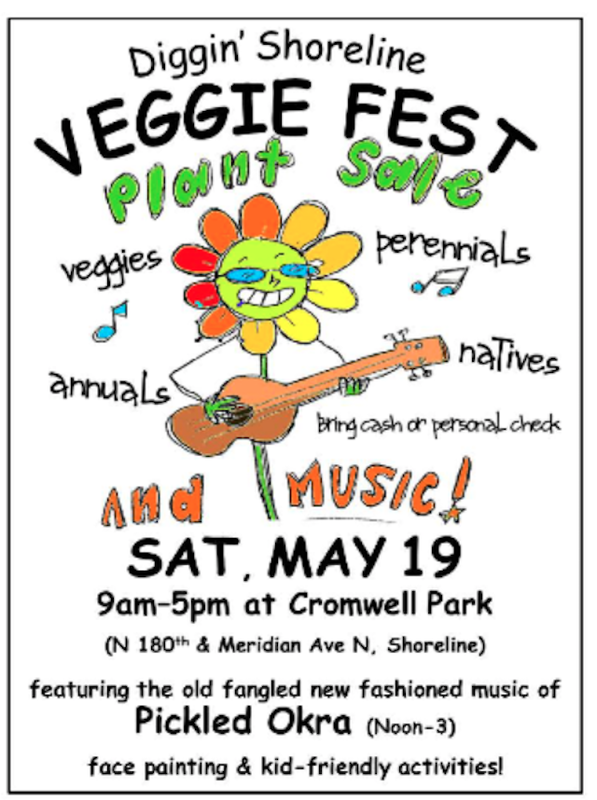 Come on out rain or shine and celebrate Spring with Diggin’ Shoreline at Cromwell Park N 180th and Meridian Ave N.
We’ll kick it off with Diggin’s annual plant sale at 9am. You’ll want to arrive early to get your favorite heirloom tomatoes and other veggies, annuals, perennials, and natives. At Noon the fun begins with the old fangled, new fashioned music of PICKLED OKRA. Bring a brown bag lunch, a lawn chair and your dancing partner. At the Kid’s Nature Activity Center, make a dinosaur or fairy garden, paint a rock, make a bee bath, and get your face painted. It’s all free of charge and family-friendly! Of course, if you happen to buy a plant or two, you’ll be helping support a great community organization. Diggin’ Shoreline is a local, all-volunteer, 501©3 non-profit organization serving Shoreline and Lake Forest Park. Together, we practice, teach, and learn from each other healthy, sustainable ways to garden; build community, and have fun!